The Pushkar Fair is India's greatest tribal gathering, featuring performances by musicians and dancers from Thar Desert. Pushkar in Rajasthan is usually crowded with visitors during its Pushkar Fair and every November, it gets even more crowded, with thousands of people- cattle traders, shopkeepers, merchants, dancers, musicians and artisans among them- congregating at Pushkar for a five-day long event which holds the distinction of being India's largest cattle fair. The fair is a memorable one with cocktail of sights, smells and sounds. For the space of five days, Pushkar's narrow lanes are the scene for hectic trade and barter, for merrymaking and rejoicing- and despite the fact that the increasing commercialisation of the Mela has made it a whole lot more touristy than before, it continues to be a delightful experience. This is by far and away the best time to visit Pushkar, and what with the fair draws a huge number of visitors from across the globe. 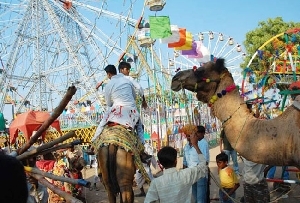 Events during Pushkar Fair Camel race contest is usually the first event during Pushkar fair. The camels are decorated in finery and are raced to reach the finishing line before the music stops (something like musical chairs). Vying for the first prize the camel is judged upon its speed its equipment and ornaments, its capacity to interpret and carry out its masters' commands are the criteria of selection. How can we forget to mention the well-known longest moustache, matka phod and bridal competition that attract thousands of tourists all over the world. Fun Activities at Pushkar Get yourself inked in Pushkar as there are many places that offer to do body tattoos. 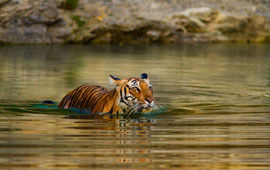 You can also get body piercing or simply enjoy the camel rides and local delicacies at the Pushkar fair. If you are not keen on doing any of the above try to enjoy this spectacle fair by standing in the hot air balloon. The SkyWaltz offer elating balloon flights over Pushkar that will cost you $400 per person.